Experiences with the 1986 and 1997 levee breaks in Yuba and Sutter Counties and other “high–water” events over the past thirty years afford us some expectations for the types and extents of tree damage that may result from orchard flooding in 2017. Part 1 discussed some generalities of flooding damage and two key types of damage that tend to follow prolonged orchard flooding, i.e., waterlogging and Phytophthora diseases. This part reflects on the floods in 1986 and 1997 and considers ways in which specific conditions associated with those floods seemed to affect orchard outcomes. Finally in Part 3, we will offer management steps to consider in dealing with orchard flooding in 2017. 1986. A subtropical storm brought heavy precipitation to northern CA and moderately high snow levels lasting for nearly 10 days, from February 11-20. Rainfall in the northern Sierra Nevada at 5,750 feet registered almost 56 inches. The water roared down the Yuba River where the levee broke February 20 in the evening flooding Linda and Olivehurst and acres of orchards. Walnut and prune orchards were flooded for 45 days from late February through mid-April. Photo 1. In the 1986 flood, some walnuts were flooded for 45 days. Photo: J. Hasey, taken March 1986. 1997. A polar system left several feet of snow in the Sierra on December 21-22, 1996. From December 26, 1996 through January 3, 1997, the weather pattern shifted to warmer and wetter storms of tropical origin that brought relentless precipitation, excessive runoff, and significantly melted the snow pack leading to widespread flooding. Oroville dam was spilling 160,000 cfs by January 1 and water was again roaring down the Yuba River. Late on January 2, a levee broke on the Feather River at Country Club Road in Yuba County flooding thousands of acres of orchards. Three weeks later, another levee gave way on the Bear River, causing more flooding in some of the same areas. In Sutter County, the west side of the Sutter Bypass levee broke in early January flooding the Meridian basin. Based on what we learned from orchard responses to the widespread flooding in 1986 and 1997 and less-extensive flooding of river bottoms in several additional years, we have some expectations of the problems growers will face in orchards flooded this year. A major difference between the 1997 flood and that of 1986 was that the flood occurred in later February in 1986, when many tree crops were becoming active. In 1997 by March, we observed waterlogging damage on collapsing peaches on heavier soil that had only been flooded a short time in January. Where trees are actively growing and then flooded, as in the river bottoms during our wet springs such as in 1995, most of the trees that died were in low areas where the water sat for prolonged periods. Those trees that were only in the fast-moving, cold water did fine, except for the submerged shoots. After the 1986 levee break, water sat for several weeks in certain low lying areas. In these areas, as the water receded, symptoms of aerial infection by Phytophthora were apparent in some orchards. Aerial infections by Phytophthora were indicated by bleeding cankers in aboveground parts of trees, i.e., on trunks, scaffolds, branches, limbs, and hangers, as opposed to crown and root infections, which originate in soil. 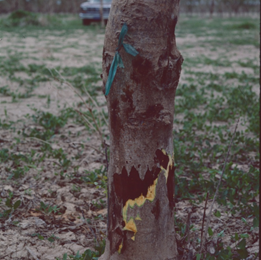 The aerial Phytophthora cankers on walnuts and prunes in 1986 tended to occur in orchards that had been flooded for about 45 days, from late February through mid-April (Photos 1 and 2). Photo 2. 1986 flooding caused aerial Phytophthora bleeding cankers and tissue damage (evident where the bark was removed). Photo: Janine Hasey. 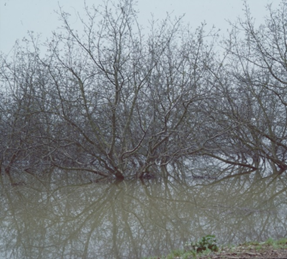 After the 1997 levee breaks, we sampled flood waters in several orchards in the Arboga area (Yuba Co.) and Meridian (Sutter Co.) in early February. Using pear fruit to “bait” the Phytophthora, we found that every orchard location had species of the pathogen present. By mid-February 1997, we observed the first symptoms (amber colored gum) of aerial infections by Phytophthora on peaches, and soon afterwards the symptoms were seen on prunes. Cutting into the tissue below the gumming revealed reddish brown cankers. Many of these cankers, more on peach than on prune, continued to look active. With peaches in the flood zones and the river bottoms, there were multiple aerial Phytophthora infections on every tree in every orchard we surveyed, regardless of orchard age. Many of these orchards were flooded less than a week. By March 1997, we still had not seen aerial Phytophthora in flooded walnuts (bleeding in limbs and branches), suggesting that dormancy had offered them some protection from Phytophthora.